The Church of the Good Shepherd caters for all ages. We have a weekly service for pre-schoolers at 10.30 a.m. beginning on Wednesday 8th January 2014. This runs in term time only. We also have a creche for the 9.30a.m service on a Sunday. At the age of 3, the children can move on to our Scrambler group and remain in Junior Church until they are old enough to go to Secondary School. They can then join Pathfinders which is followed by Yobs (Youth Orientated Bible Study) once they are 14. 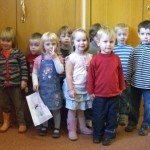 We also run Messy Church bi-monthly. Look at our Future Events calendar to find out when the next session is.